De Tomaso finally debuted its crossover prototype today in Geneva, now called the Deauville, and outlined its ambitious future plans: next up will be a new Pantera sports car and the reborn firm also hopes to buy Fiat's closure-earmarked Termini Imerese factory on Sicily. 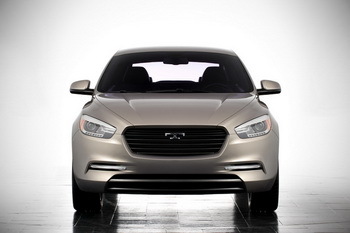 The Deauville, which has been designed and engineered by Pininfarina, will go on sale this summer and De Tomaso claims that it already has a 'backlog' of 1,500 units, somewhat impressive for a car that only debuted in public today. The next car in the pipeline for the project, which is led by veteran Italian businessman Gian Mario Rossignolo, will be a new successor to the legendary Pantera. That car will in fact debut at the end of this year to coincide with the 40th anniversary of the sports car. The third car, a limousine, will be launched next year. Meanwhile De Tomaso's plans for Termini Imerese are even more ambitious, it plans a compact SUV and upscale city car which will be built together to the tune of around 38,000-40,000 units a year, utilising the facilities of both the Sicilian plant, which Fiat will close later this year when production of the current-generation Lancia Ypsilon ends, and Pininfarina's former Grugliasco facility. 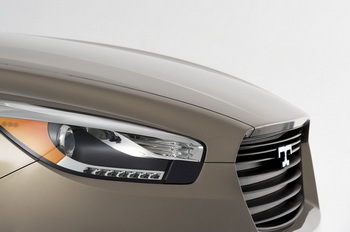 There is no word from De Tomaso about the underpinnings of the Deauville, especially with observers having noted that the entire cabin of the Cadillac SRX crossover has been lifted straight into the car (along with a new steering wheel badge), implying that it might turn out to be little more than a reskinned version of this car and thus be based on GM's Thema Premium architecture, while utilising the UNIVIS system for the new aluminium bodywork. A further strong hint comes from the press release that states that "Powertrain Integration", a Detroit-based company that reworkes GM powertrains for the aftermarket sector is supplying the mechanicals, meaning that the three claimed engines: a 300 hp 3.0 litre and 550 hp petrol engines and 300 hp 3.0 diesel, will all GM sourced units. De Tomaso says that the car will be four wheel drive which would neatly carry over the all wheel drive system that already is engineering into the SRX (Theta) platform. On its website Powertrain Integration says: "Powertrain Integration is the automotive industry’s first total system solution company for OEM engines, transmissions and complete drivetrains. Using the GM product line-up, we provide the broadest range of systems, engine components and services specifically focusing on the unique needs of the niche OEM automakers. From low to high volume programs, we provide the customer with complete packaging, design, engineering, emissions certification and dress assembly capability for the complete powertrain system. 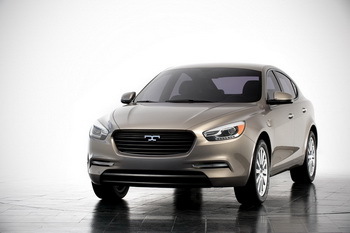 Our goal is to provide a plug and play engine and transmission package." The Deauville is a 4-doors and 4 wheel-drive Sport Luxury Sedan, equipped with a V6 cylinder turbo engine with 300 horsepower. A car that has been developed with an affluent customer in mind who looks both for safety on all road surface types, maximum comfort as well as a highly versatile vehicle, with a spacious interior and the luxurious comfort of top-of-the-range materials. The name, Deauville, remind the historical 4-door De Tomaso vehicle and seemed appropriate to underline the sporty look combined with the luxury of the sophisticated cosmopolitan French town in Normandy. Further features of the car are include easy access to both front and rear seats with a ground clearance of only 350 mm and no obstructions on opening the doors flush with the side-rails, driving position similar to those of a SUV guaranteeing a wide view, wide interior space with a compartment height of 1250 mm and cargo capacity of 700 litres. 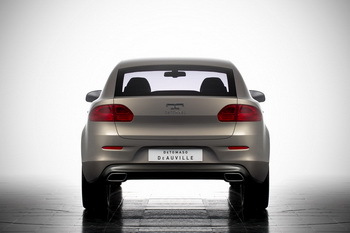 A further qualifying element of the Deauville is the design of its aesthetics which has been developed by Pininfarina. Some design details, such as the hexagonal shape of the radiator grill, the cut of the windscreen and the headlights, recall the De Tomaso cars of the past. Another trait d’union may be traced in the car’s design: the three top wings of the radiator cowling which are mirrored in the headlights and then continue along the lateral air vent and on the taillights. Moreover the front view is marked by the distinctive large radiator cowling which expresses fighting spirit and sportsmanship. The team of the De Tomaso Style Centre have dedicated particular interest and attention to the design of the interiors that have been built and assembled entirely by the De Tomaso craftsmen using only luxury quality materials such as leather, carbon and Alcantara. The finishes and the seams of the upholstery are crafted by the skilled workers of De Tomaso and the completely manual assembly is a guarantee of the quality which testifies to the past and future "Made in Italy" manufacturing excellence. The development of the new model is centred around the valorisation of the concept of "Made in Italy" manufacturing, refreshing and refining those features of beauty and craftsmanship which belong to Italy’s manufacturing history. Each Deauville is a unique item which stands alone. The Deauville is equipped with powertrain and components produced by qualified OEM manufacturers integrated in collaboration with Powertrain Integration of Detroit. Powertrain Integration is a specialised company which develops and supplies a wide range of propulsion systems designed to meet the needs of particular manufacturers. The V8 version is also going to be presented in the near future, equipped with a 8 V cylinder engine with 550 horsepower, as well as a 6-cylinder diesel version with 250 horsepower. The car is made using UNIVIS, an innovative technology which assembles the bodywork using extruded aluminium profiles connected to each other by way of laser-finished soldered cross-shaped joining members. This new technology, developed and patented by IAI (Innovation in Auto Industry) a holding which controls the De Tomaso group, enables a significant reduction in terms of time and investments necessary to design a car as the number of moulds is reduced to a few dozens. The Deauville, that has an around 1,500 unit backlog, will start to be produced in the summer, with deliveries starting from September. De Tomaso Automobili is the new business venture promoted by Mr. GianMario Rossignolo and achieved by the sons Gianluca and Edoardo together with a team composed by young managers. 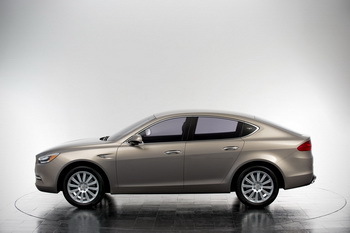 It’s based on the production of luxurious cars with an innovative technology and fully built in Italy. This business venture, which allows the achievement of the best Italian skills all over the world, aims to contribute to the industrial Italian system re-launch and, at the same time, it wants to give its contribution to the Made in Italy valorisation at a global level. De Tomaso foreseen a running production of 8,000 cars of the three models available, of which 3,000 Sport Luxury Sedan (Deauville), 3,000 limousines and 2,000 coupès. After the Deauville, the second car to be developed will be the new Pantera, a super two-seats sports car with supreme performance. The New Pantera is planned to be presented at the end of 2011. In this way De Tomaso wants to celebrate the 40th anniversary of the historical De Tomaso Pantera that was revealed for the first time in 1971. 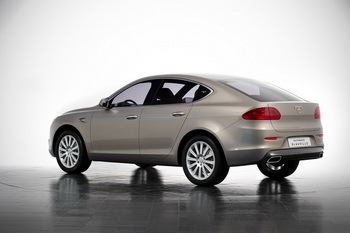 The third car planned is a limousine which we foreseen on the market at the end of 2012. These three cars will be built by the 900 staff of the the former Pininfarina plant in Grugliasco (Turin) where the bodywork is assembled and the paintwork and finishing operations are carried out, and by more than 150 manufacturers of the former Delphi plant in Livorno where mechanical operations and operations related to sub-assemblies are carried out. Investments amounting to 116 million euros over the next 4 years related to the 3 models is available. De Tomaso is also negotiating the purchase of the Sicilian Fiat plant of Termini Imerese where large quantities of the two new models are to be produced, taking the concept of "Luxury" to lower market segments. In particular, the De Tomaso business plan for Termini Imerese foreseen the expansion of the range through the production of a luxurious citycar and an high level minisuv that will add 38,000 / 40,000 units to the production of Grugliasco and Livorno De Tomaso plans for Termini Imerese could be confirmed only after the definite approval of National Italian Institutions, local Italian institutions and trade unions. De Tomaso's business plan for Termini Imerese has foreseen the involvement of all the 1,500 staff actually working in the Fiat plant.